Hello. Podcast #15 is an example of how I am using MP3 files as "StudyCasts" for my students. I have created a studycast for each of my unit tests so far this year and I have found them to be a huge success. At first I wasn't really sure how many students were listening to them but I am now convinced that this is an effective means of delivering content to them to help them review for a test. I have some data from an informal survey of my students on studycasts and MP3 players that I will use in an upcoming show. I have found that just me talking for 10-15 minutes is not the most exciting thing to listen to so I have added some background music to make it a little more interesting. The music I used in this studycast is from Faze and entitled "Mad Flava" from the Podsafe Music Network. Links are included on the shownotes. Let me know that you think by e-mailing me at speakingofhistory@gmail.com I would be interesting in learning about any other teachers using MP3 files as a way to review for tests and how it has worked with their students. Hello. This episode of Speaking of History is the longest to date. Last month I was honored to recieve a Missouri Teaching With Cable Award from the Missouri Cable Telecommunication Association in Jefferson City. It was an amazing event and I was able to meet and visit many people invlolved with educational technology. The award banquet featured many distingued guests that work with education in the cable industry - including Cable in the Classroom, A & E Networks, Time Warner, Comcast, Charter Communications, Discovery Networks, etc. After dinner I was able to interview several of these individuals about upcoming projects for teachers. This episode also describes the Missouri Teaching With Cable Awards and I would encourage everyone to submit an application next year. If you have a comment about this episode you can e-mail me at speakingofhistory@gmail.com or leave a comment on the bottom of this entry. Article on the Upcoming History Channel Production: "10 Days that Unexpectedly Changed America"
Podcast #13 - Join Our Class in Reading "The Year of the Hangman"
Hello. The topic of this episode of Speaking of History is reading in the junior high American History Classroom. We will discuss an online reading blog, graphic novels and SSR. 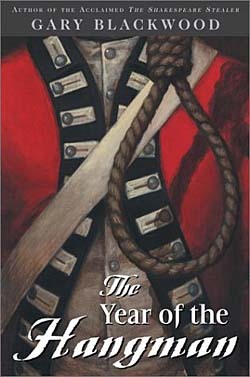 As part of a grant from the Liberty School District Foundation, I purchased 60 copies of The Year of the Hangman by Gary Blackwood. I will be giving these copies out to my students and we will be discussing the book in the form of an online blog starting on March 6, 2006. We are inviting you to be a part of the book blog. The book is available in paperback for $6. It is a great historical novel with a twist - it is an alternate history book. In this novel the British have defeated the colonists in the Revolutionary War. Ben Franklin and Thomas Jefferson are in exile in New Orleans trying to figure out how to break George Washington out of prision where he is awaiting execution. A 15 year old British boy - Creighton Brown - is caught up in the middle of spying and relationships. His actions could impact the fate of two nations. If you are interested in joining us please e-mail speakingofhistory@gmail.com for more information. It could be a single student who likes to read or an entire class. We would love to hear from you! The second topic of the show is graphic novels and my discovery of an adaptation of the Red Badge of Courage by Wayne Vansant. The entire novel is written in graphic format - like comic book for lack of a better term. It looks awesome. Check out the link below for more information on this new twist on an old classic. Please let me know if you have used graphic novels in the classroom. The final segment takes a look at SSR and how just 20 minutes of reading at the start of each day has transformed the culture of our building into one of reading and literacy - for both teachers and students. I have always been curious about the availablity of items with a custon logo through the Internet so I checked out CafePress and set up an account. I designed a logo for the podcast and within minutes had my store up and running with items that bear the show logo. You can purchase coffee mugs, t-shirts, mouse pads, magnets and a tile coaster with the logo. The store gives the storekeeper the option of charging more than the base price but I did not mark up any of the prices. I figure if you are willing to purchase an item to promote the show the least I can do is give it to you for the lowest possible price. The main reason I wanted to create some products with the show logo are to give away some items to friends and family as well as have a couple of items to give away at upcoming workshops where I am presenting information on my podcast. I also thought it might be cool to drink my morning coffee in an official Speaking of History Podcast mug. Let me know what you think of the logo by dropping me an e-mail at speakingofhistory@gmail.com I'm working on the rought drafts of a couple new shows and hope to have a couple of new episodes posted this week. Thanks.